Last month we featured the Eye, Ear, Nose and Throat Hospital--a one-time neighbor of NOPL's Main Library. This month we're visiting another neighboring medical facility that is gone for now, and possibly gone forever. 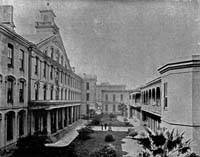 Almost 100 years after its founding, Charity Hospital moved to Tulane Avenue (then still called Common Street) in 1832 after occupying several sites in or near the Vieux Carre, and on Canal Street. This structure survived for more than a century until its demolition in 1937 to make way for the high rise structure that still stands, though now empty, just a couple of blocks away from the Main Library. 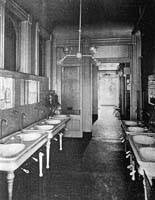 The images for this month depict the old hospital. They're taken from Charity's 1906 and 1907 annual reports, housed in the Louisiana Division's State Documents Collection. 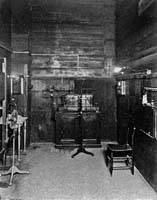 The photographs are from the 1906 report since none were included in the one for the following year.